Grandma and I are HUGE cocoa fans! We like coffee too, but my mom is the real coffee drinker of our home. When we got our box of cocoa, my mom was so excited, because she thought it was coffee, lol! That's good for me and grandma though - More for us : )! All 6 flavors were delicious, and unique. Grandma is a big fan of the milk chocolate, and my favorite was probably the campfire hot chocolate! I love the different flavors, and I'm happy to have this treat for the holidays. I would definitely recommend them - And for this price, you can't go wrong. Also, if you want an extra chance to win, check out Best Coffee Gift Ever's Facebook Page, and enter to win a free box of coffee, every day, through Christmas! If you're a big fan of K-cups, then this is a giveaway for you! It's not coffee - But it's a delicious, holiday tradition! 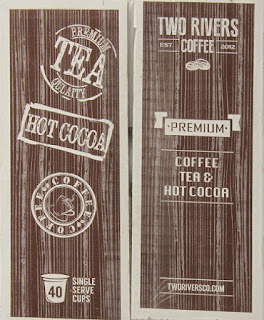 For this giveaway, we're featuring a delicious assortment of hot cocoa, from Two Rivers Coffee! This could make an awesome gift for the k-cup user in your life, or also just add a little holiday cheer, and delicious comfort to your home! 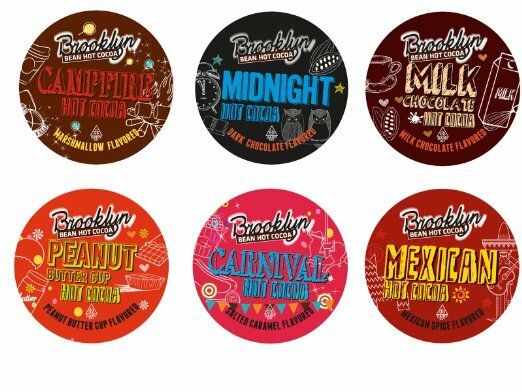 One lucky winner will receive a 40 pack of Brooklyn Bear Roastery Hot Cocoa, from Two Rivers Coffee. Open to US residents only. Good luck! Disclosure: The bloggers involved in this giveaway were not compensated, and are not responsible for prize fulfillment. Lil' Blog and More received free product in exchange for this post. All opinions expressed within this post are her own, and were not influenced in any way. Must be 18 years of age or older to enter this giveaway. This giveaway starts December 13th, 2015, and will end on December 29th, 2015 at 11:59 pm. The winner will be emailed, and have 48 hours to respond, or a new winner will be chosen. Once a winner is drawn and confirmed, the name will be announced on the GiveawayTools form. I'd like to try the Peanut Butter Cup hot cocoa! Junior mint cocoa geez I did not know it exist! I would love to try the tootsie roll! I would like to try Friendly's Mint Chocolate Chip. The Charleston Chew hot cocoa sounds really different – I'd like to try that. I would like to try the sugar babies. They all look great. I would love to try the Boardwalk Blend Medium Roast flavor. It looks absolutely delicious. I'd love to try the Junior Mints kcups. Clever idea and tasty too!